Five Ukrainian soldiers were injured in hostilities in the anti-terrorist operation zone (ATO) on Tuesday, and three soldiers were killed as a result of stepping on a land mine, Ukrainian presidential administration's spokesman for ATO matters Andriy Lysenko has said. "In the past day, three Ukrainian soldiers were killed and five were wounded in hostilities," he said at a briefing in Kyiv on Wednesday. Lysenko said that the three soldiers were killed and two were wounded in the area of Mayorsk, two others were injured in Leninske, and another one in Verkhniotoretske. Militants conducted nine attacks in the Donetsk area. The most intense shelling was registered Verhniotoretske, the suburb of Horlivka, the industrial zone of Avdiyivka and Donetsk airport. In the Mariupol area, the enemy continued to shell Maryinka and Shyrokyne. Fourteen attacks were reported there. 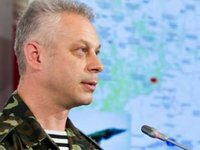 Lysenko said that the Luhansk area was relatively calm.